Beech&#174; Compact Battery Operated Work Positioner PS-3080B 80&quot; Lift 1000 Lb. Cap. 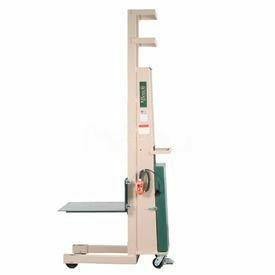 Beech® Compact Battery Operated Work Positioner PS-3080B 80" Lift 1000 Lb. Cap. Usually ships in 16 to 19 days (ships from US) Estimated lead times do not include weekends or holidays. Transit time is determined by shipping method and destination. Orders requiring credit information might take additional time. Beech® Compact Battery Operated Work Positioner PS-3070B 70" Lift 1000 Lb. Cap. Beech® Compact Battery Operated Work Positioner PS-3058B 58" Lift 1000 Lb. Cap. Beech® Compact Battery Operated Work Positioner PS-2470B 70" Lift 1000 Lb. Cap. Take the Work out of Lifting! 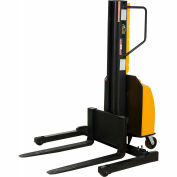 This Stacker comes equipped with powered lifting hydraulics for precise load positioning. 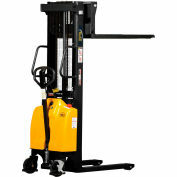 Lift is easily controlled with a push button remote with 10' cord. Heavy duty deep-cycle battery is easily recharged via the integral 120V 10 amp charger. Standard features include oversized hydraulic ram, integral overload relief valve and heavy duty 9000 lb. yield roller lifting chain. Durable steel mast features an acrylic safety shield that provides an unobstructed view for the operator. Lifting platform features welded and unitized construction for strength. 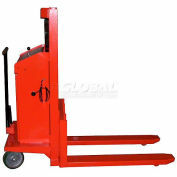 Rolls easily on phenolic load and steer wheels with roller bearing and grease fittings. 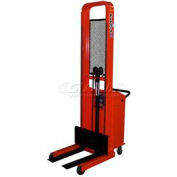 Stackers are equipped with a floor lock for stationary positioning. 2 Year Limited Warranty. Beech® Compact Battery Operated Work Positioner PS-2458B 58" Lift 1000 Lb. Cap.